“All Things Bright and Beautiful,” hymn no. 267, is the opening hymn. 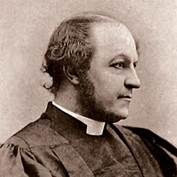 The hymn was authored by Cecil Frances Alexander in 1848. Cecil Frances Alexander was the daughter of Major John Humphreys, Milltown House, County Tyrone, Ireland. Major Humphreys had fought in the Napoleonic Wars, and his family was part of the Protestant aristocracy of Ireland. Cecil Frances Humphreys was born in in Dublin in 1818 and married the Right Reverend W. Alexander, D. D., Bishop of Derry and Raphoe in 1850. At the time of their marriage, the Rev. W. Alexander was Chaplain to the Lord Lieutenant of Ireland and Rector of Termonamongan. The verses of “All Things Bright and Beautiful” were first published in 1848 in her book, Hymns for Little Children. She wrote nearly 400 hymns and poems during her lifetime. 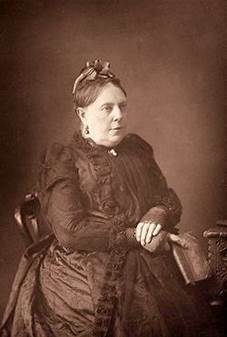 She also authored “Once in Royal David’s City,” “There is a Green Hill Far Away,” and “Jesus Calls Us O’er the Tumult” (https://youtu.be/GdGe-spEHJ4 ). She died in 1895. The tune is ROYAL OAK, a traditional English tune. The “royal oak” from which the tune gets its name is a tree at Boscobel, Shropshire, England. The tree became famous after the Battle of Worcester on 03 Sep 1651, when Charles II escaped capture by Oliver Cromwell’s New Model Army by hiding in it. Oliver Cromwell died in 1659, and his "feeble son" Richard was not at all good at placating the various generals of Cromwell’s New Model Army. Also Richard Cromwell lacked any military training himself, and he didn’t have the diplomatic skill to play the generals off against one another. So the English Parliament told Charles II he could come back and be king as long as he allowed England to remain Protestant. Someone wrote a song to celebrate the restoration of the monarchy that took place on 29 May 1660, and the song was called, naturally enough, “The Twenty-Ninth of May.” The tune for the song was called ROYAL OAK. Perhaps that is why the twenty-ninth of May is also called “Pinch-Bum-Day,” in memory of the time when the future king hid in an oak tree and whose discovery and capture by the Puritans had been avoided by his having his bum be regularly pinched by Colonel Careless, to prevent the king from drifting off and falling out of the tree. They still celebrate “Royal Oak Day” (also called “Oak Apple Day” and “Pinch-bum Day”) in England on May 29. After watching the video of Morris dancing, John said he can understand why Cromwell banned it. She was born 12 Oct 1925 in Roseville, Ohio. Lois Irene Myers was the daughter of Earl Francis and Margaret Byrd (Weaver) Myers. Her father was a potter at the Nelson McCoy Pottery Company in Roseville, Ohio. She received her B.S. degree (with distinction) from The Ohio State University in 1946. Then she did postgraduate work at Ohio State and at Queens College. She taught in the public schools in Ohio and New York from 1946 to 1965. On 07 Jun 1947, she married Jack Wayne Emig. From 1954 until 1990 she was a private teacher of piano and theory while also composing. She composed 250 choral works, nine cantatas, and two piano books. She has also served as a church organist. It visually interprets the passage entirely literally and is a bit weird. I like the anthems based on this passage better. 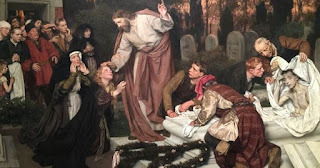 A similar story appears in the Secret Gospel of Mark, and some scholars believe that version of the story is an earlier form of the story in John while others doubt that a Secret Gospel of Mark ever existed. Quotations from the Secret Gospel of Mark appear only in a purported letter of Clement of Alexandria (150 – 215 C.E. ), and some have concluded that letter to be a forgery. Later in the narrative, Jesus goes to the tomb. 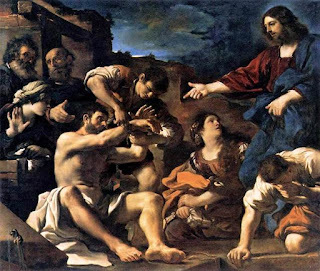 In the 1619 painting by Guercino shown below, Lazarus, despite having been buried for four days, appears not to have undergone any decomposition. In fact, he seems to be in quite good health. 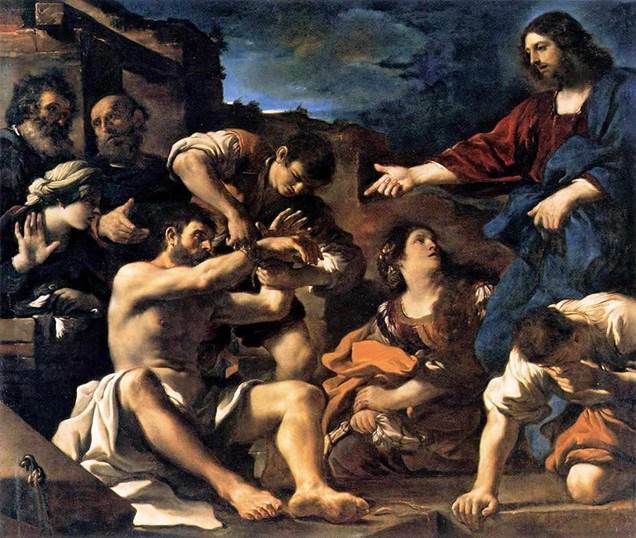 Most artists represented Lazarus as a frail youth. The second hymn is “Breathe on Me, Breath of God,” no. 316. ,” with words by Edwin Hatch, 1886. The words first appear in his self-published little book Beyond Doubt and Prayer, 17 pages. 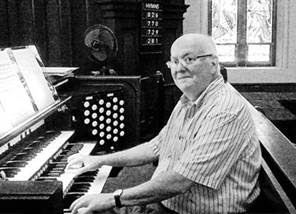 Most of his life he was the organist at St. Peter’s Church, Oldham (1868-1914). His father preceded him there as organist, a position his father had held at St .Peter’s for forty-eight years. Robert Jackson held the same post as his father for forty-six years. So, together, they were the organists at St. Peter’s, Oldham, for nearly a century. Jackson died 12 Jul 1914 at Oldham. The title of the sermon is "Ground Zero vs. A Valley of Life." The closing hymn is “By Gracious Powers,” hymn no. 342. Dietrich Bonhoeffer authored the words in 1944. Fred Pratt Green translated the German to the verses in English in 1972. Dietrich Bonhoeffer was born on 04 Feb 1906 in Breslau, Prussia. He was a Lutheran pastor and theologian who was opposed to Nazism and to the persecution of the Jews by Hitler. At age 24, in 1930, Bonhoeffer went to the United States for postgraduate work at Union Theological Seminary in the City of New York. He wasn’t impressed by how theology was taught and developed at Union. (He said, “There is no theology here.”) But he was impressed by Reinhold Niebuhr, under whom he studied. He also met Frank Fisher, a black seminarian who took him to the Abyssinian Baptist Church in Harlem. Bonhoeffer taught Sunday School there. It was at the Abyssinian Baptist Church that he heard the social justice gospel preached by Adam Clayton Powell, Sr. Bonhoeffer returned to Germany in 1931. He was opposed to Hitler from the start. Bonhoeffer attacked the new regime only two days after Hitler was made Chancellor in 1933. Bonhoeffer advocated that pastors stop officiating at funerals, weddings, and baptisms, but Karl Barth thought that sort of opposition was too radical. Bonhoeffer then left Germany in the Fall of 1933 to pastor German-speaking churches in England, at Sydenham and Whitechapel. Barth accused him of abandoning his work to resist the Nazification of the German churches. 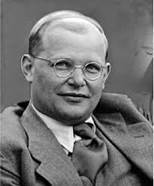 Bonhoeffer returned to Germany in 1935 and established an underground seminary, which the Gestapo closed in 1937. Next, he moved from village to village in eastern Germany while conducting a seminary on-the-run. “I must live through this difficult period in our national history with the people of Germany. I will have no right to participate in the reconstruction of Christian life in Germany after the war if I do not share the trials of this time with my people... Christians in Germany will have to face the terrible alternative of either willing the defeat of their nation in order that Christian civilization may survive or willing the victory of their nation and thereby destroying civilization. I know which of these alternatives I must choose but I cannot make that choice from security." He returned to Germany where, in 1941, he was prohibited from publishing or speaking publicly. Then he joined the anti-Hitler resistance. In April 1943 he was arrested by the Gestapo and sent to Tegel prison, where he remained for one and a half years. After the discovery of his connection to the groups that attempted to assassinate Hitler, Bonhoeffer was moved to the house prison (a detention cellar) of the Gestapo. He was next transferred to a concentration camp. He was executed by hanging on 09 Apr 1945 at Flossenbürg concentration camp, only two weeks before the camp was liberated by the Allies. 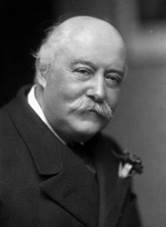 C. Hubert H. Parry was born 27 Feb 1848 and died 07 Oct 1918. He composed the tune JERUSALEM which is used with the words of poet William Blake to tell the story of the visit of Jesus to England as a child, when he accompanied Mary’s uncle, Joseph of Arimathea, a tin merchant. “And did those feet in ancient times, walk about England’s mountains green, and was the Holy Lamb of God on England’s pleasant pastures seen.” https://youtu.be/C79L3vjKAWQ The song is the unofficial national anthem of England. The prelude is “Cross of Jesus (Meditation)” by Charles Callahan. It is an arrangement of the communion hymn of the same name. The original tune is by John Stainer (1887). In our hymnal, the tune is used “For the Bread which You Have Broken,” no. 509. Charles Callahan was born in 1951 and grew up in Cambridge, Massachusetts. He graduated from The Curtis Institute of Music in Philadelphia and The Catholic University of America in Washington, DC. He has published two books on the history of American organ building—one on classic American organs and one on Aeolian-Skinner organs. In 2014, he received the Distinguished Artist award from the American Guild of Organists. 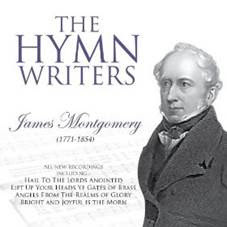 This tune is also used as a setting for “Come, Thou Long-Expected Jesus” although in the Presbyterian Hymnal, that hymn (by Charles Wesley) is set to STUTTGART (no. 1) and HYFRYDOL (no. 2). John Stainer was born in London, 06 Jun 1840. His father, who played piano, organ and flute, was the schoolmaster at St. Thomas’s School, Southwark. By age seven, John Stainer could play Bach’s “Fugue in E Major” on the organ. Stainer was the organist at St. Paul’s Cathedral from 1872 to 1888. He received a knighthood from Queen Victoria in 1888 for his services to music. He died in Verona, Italy, on 31 Mar 1901. There is another work incorporating HFRYDOL by Charles Callahan. It is his Partita on Hyfrydol. I think the “Voluntary” may be the “Finale” movement of Partita on Hyfrydol. I didn’t find the “Finale,” but I did find the adagio movement of Partita on Hyfrydol.